This event will cover all promising applications of graphene, including graphene composites, supercapacitors and batteries, functional inks, logic and memory, touch screens, sensors and bio-electronics and beyond. Our audience will develop a comprehensive yet detailed understanding of the state of technology and market per graphene application area. The sixth international conference and tradeshow covering the latest technology developments, applications and end user requirements for Graphene and 2D Materials. Click here to see full list of speakers. 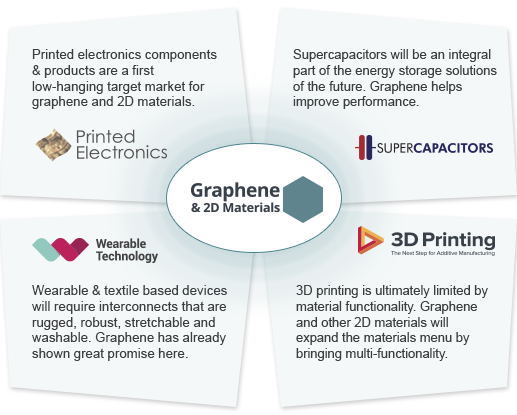 Graphene has enormous potential. It has already come a long way towards commercialization, despite its short history. Several companies have gone public while others are in their second or third rounds of financing. The production capacity has risen and governments have continued to commit staggering research funds. 2D materials have also entered the scene, promising to complement graphene. Hard questions still remain however as companies look for the killer applications or high volume success in replacing an incumbent. The fifth IDTechEx business-focused Graphene and 2D Materials Europe conference and tradeshow in Berlin on 28-29 April will bring together key technologies, suppliers and end users. This year IDTechEx will also focus on other 2D materials beyond graphene. Graphene and 2D Materials Europe is co-located with a series of conferences and tradeshows that constitute the primary short- to medium-term end use sectors for graphene and other 2D materials. These include printed electronics, supercapacitors, 3D printing and wearable technologies. See the full picture about each co-located event. You will have access to all these events. The conference brings together users, material providers, equipment makers, policymakers, academics and investors from over 30 countries. More than 20 companies will present over the two days. The Graphene and 2D Materials Europe Tradeshow on 28-29 April runs alongside the conference tracks. This It is the largest tradeshow on the topic, and is part of the Printed Electronics Europe 2015 tradeshow featuring more than 200 exhibiting companies. The tradeshow will cover equipment providers, material providers, manufacturers and integrators. In addition, Masterclasses and Tours to local companies will be held prior and post the conference on different topics. IDTechEx analysts, who have conducted extensive research programs on Graphene and Carbon Nanotubes, would be delighted to have free 1 to 1 meetings with you to help you understand the topic and your opportunities. IDTechEx Graphene conference is a must for our company. It's where we meet our clients and evaluate our competitors. It brings together producers, integrators and scientists to discuss the state-of-the-art in graphene production, processing and performance. Decision makers from the largest companies attend and discuss the potential and obstacles on the way to adoption. The calibre of the highly-qualified speakers allow us to identify where graphene currently stands with respect to competing materials such as silver, conductive carbon, nanotubes and other low-dimensional materials. Our company, Bluestone Global Tech, is a material start-up company launched a mere 5 months prior to IDTechEx Graphene conference. As a newcomer, we needed to leverage our lean budget to garner maximized return on investment. In researching our allocation, it quickly became clear that exhibiting at IDTechEx Graphene conference was a top option. From a planning perspective, the IDTechEx team was fantastic to work with: accessible, responsive and resourceful. With their able and genuinely caring guidance, we utilized a complimentary program of exhibition, speaking, product demonstration and advertising. Employing these efforts led to our firm nearly doubling our investment with sales garnered through the show. Thanks for making the 2014 show a success for us. We will see you next year, IDTechEx! The IDTechEx Graphene conference conference was the best graphene event I've attended thus far. It was well attended by all of the major players in the field, and the talks were a great mix of technical and market information. The Tradeshow was also well done, with a great mix of graphene companies and relevant industrial partners/customers in polymer, film, printing, and flexible electronics. Graphene Frontiers will definitely be back next year! Cambridge Graphene Platform exhibited at this event and I am so busy following up leads that I don't have time to say all the positive things I wish to say in this quote! This is by far the best commercial event available.